Braised Pork (Left) & Beef Noodle Soup (Right) at Taiwan Bento in Oakland, California. 2016. Interview with Willy Wang, the owner of Taiwan Bento, a Taiwanese restaurant serving traditional home-style cooking in Uptown Oakland. I arrive at the brightly lit entrance of Taiwan Bento and look up to be greeted by an unusual resident, a giant origami crane; it guards the doorway like one of those concrete lions that often sit at the entrance of Chinese restaurants. Stacy Tang, the owner’s wife, helps run the establishment with her husband. As she was busily preparing for their lunch run in the kitchen that morning, she made time to greet me as she continued her hectic morning routine. Willy arrived shortly after and we sat down in the back corner of the second floor; the soft light of a Sunday morning drifting down from the skylight above. Willy is wearing his favorite outfit, casual blue jeans and a black long sleeve shirt with the Taiwan Bento logo printed across in bold bright green letters. His laid-back personality and humble charm could relax even the most wary of visitors. Stacy Tang (Left) and her husband, Willy Wang (Right). These owners of Taiwan Bento share a laugh during a busy Sunday morning. 2016. Willy wants to educate more people about the delights of traditional Taiwanese food and he hopes Taiwan Bento will be known for this for years to come. He focuses on offering fresh ingredients and an attention to detail that goes above and beyond. From making their fresh soybean drink from scratch, to choosing the right suppliers that offer quality ingredients, to picking out their poultry with the right meat to skin ratio, their commitment and dedication is apparent in everything they do. Taiwan Bento’s ethos is best summed up by Willy’s unofficial motto, “Life is too short to not love what you're doing”. Tofu Bento at Taiwan Bento in Oakland, California. 2016. Closeup of Tofu Bento at Taiwan Bento in Oakland, California. 2016. Taiwan Bento’s culinary style is influenced by the different places that Willy (born and raised in America) and Stacy (a native of Taiwan) grew up in. The food is considered healthier and less oily than traditional Taiwanese food, a welcomed alteration for the health-conscious foodies of the Bay Area. Dishes like their Chicken Bento, Braised Pork, Beef Noodle Soup and Pork Belly Sandwich are particularly popular amongst their customers, and they offer unique and traditional options such as the Chitterlings and Oyster Thin Noodles, a popular choice in the Taiwanese night market stalls, and Boba Milk Tea or Bubble Tea, an extremely popular tea-based drink that originated from the East Asian country. Taiwan Bento excels because the combination of Stacy’s passion for food and Willy’s passion for business complements one another, creating a harmony that has kept this restaurant growing and flourishing since 2014. Chinese Calligraphy Art Event at Taiwan Bento in Oakland, California. 2016. Willy Wang holding their Chicken Bento at Taiwan Bento in Oakland, California. 2016. How did you come up with the name, Taiwan Bento? The name was an interesting one. We are going to be introducing food to people who don’t necessarily know what it is so we wanted to be as literal as possible. We wanted to go with a name that will give you some information as to what it is. We knew our concept will be quick service too. We knew it was going to be Taiwanese food for sure. The people in the Bay Area who know Taiwan, and many do; they have a very good impression about it. They understand that it is a free democracy in Asia, and many are confused about the Taiwan-China conflict and that’s fine because many of us are still confused. If they know about food, they know it is a food destination. We leveraged that and included it in the name. Our two front thoughts were Taiwan Bistro or Taiwan Bento. The word “Bento”, gives you the impression that it is a fast and casual restaurant that offers bentos. The kitchen inside Taiwan Bento in Oakland, California. 2016. The Japanese have done the best job in popularizing bentos, especially in the United States. As Stacy has told me, “Bento” is more just a style of eating. It refers to your lunchbox or a box, and you have your protein, your side vegetables, and maybe an egg too. Bentos are commonly seen in Japan, China, Taiwan, Korea, almost all of the East Asian and many Southeast Asian nations eat bento style foods. Taiwanese food is an amalgamation of Japanese food and Chinese food; I and others also think that “Bento” is very fitting. Inside Taiwan Bento in Oakland, California. 2016. Prior to this, I was actually in the energy industry. When we first opened, I was working for a solar panel manufacturer in China. After we opened, I worked for a startup in Fremont that was also in the energy industry. My background has always been in energy; I was an electrical engineer in college. After graduation, I worked in the LA area for 5 years and then went to business school where I met my wife and we came out here (to the Bay Area). Stacy had just came from Taiwan to business school so we met. I encouraged her to figure out her passion and it was very easy to see that it was going to be food. I told her that we can see how we can make it (her goals for her passion) happen. We moved out here in 2013 and in 2014, we found this space (in Oakland) and opened. Beef Noodle Soup at Taiwan Bento in Oakland, California. 2016. Has your background in business school been valuable in helping you operate Taiwan Bento? Yes. In many industries, people management, HR types of issues and operations. It takes a lot of our energy. I was working in strict manufacturing before, making solar panels. I never made that connection before but once I opened up my own restaurant, I realized that there are a lot of parallels between manufacturing and running your own restaurant. 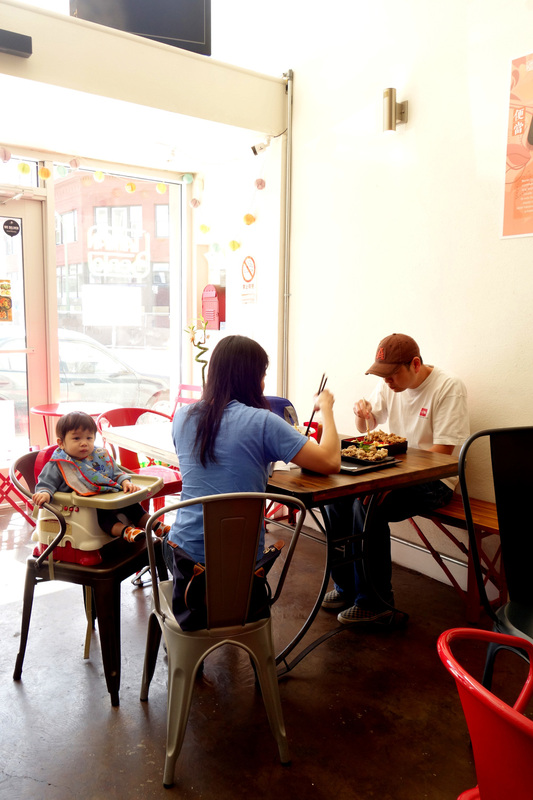 Customer enjoying food at Taiwan Bento. Stacy Tang (Left) & husband, Willy Wang (Right) preparing food at Taiwan Bento. Green Tea Cupcake (Left) & Churro Cupcake (Right) by We The Minis at Taiwan Bento. What we’re trying to do here is to issue the same product at a certain level of quality throughout an entire day. Just like manufacturing, you have this product that you’re trying to make sure is within quality, within specs. Just like in manufacturing, if you aren’t monitoring it, your quality will start to drift so you have to make sure to keep it in line. The two biggest pain points for this industry are employee management and quality control. This is not that far from an industry such as manufacturing. Customer on the second floor of Taiwan Bento. To the extent possible, we try to standardize things. You have different employees, you have employee turnover, and employees at different times. One of the unique difficulties of cooking is that you can have one unique recipe with the same ingredients and when you give it to two different people to make, it will taste different. There will be some variation, even if everything else is exactly the same. Just like in manufacturing, you have different operators at different times and you have things from different suppliers. In order to overcome that, you have to have standardized processes as to how you run your business and how you make your product. To the extent possible, that’s what we’ve done. Willy Wang takes an order via phone at Taiwan Bento. Were a lot of the dishes from your childhood or inspirations from the cooking of your mom or Stacy’s mom? I grew up in Arcadia (California) and we have lots of Taiwanese food there. I was quite familiar with the foods that we sell now. I’ve been to Taiwan several times; I still have a lot of family back there. I think that is one of the things that allows us to be unique. Stacy has the full traditional Taiwanese perspective; she only came to the United States in 2012. I bring the ABC (American Born Chinese) or ABT (American Born Taiwanese) perspective of Taiwanese food because it is a little different; it’s not exactly a carbon copy of what you would get in Taiwan. Beef Noodle Soup at Taiwan Bento. Would you say that your food is a bit Americanized? We knew that our primary business is going to be the working Americans of all races; that definitely including Asians. To me, the biggest difference between Americanized Taiwanese food and your traditional Taiwanese food is that it is less oily, which I think is a good thing. You can say it is healthier. We can still stay true to the food but bring a healthier version to all the different races that will hopefully be enjoying it. Owners (Stacy Tang (Left) & WIlly Wang (Right) in the kitchen of Taiwan Bento. For the years to come, what do you want Taiwan Bento to be known for? That’s a deep question. Stacy and I will probably differ on this. For me, I would like to be known for issuing good food and having educated more people about Taiwanese food. In the beginning, we would have customers coming in saying “Oh, is this like Thai food?” (laughter) or “Oh, I’ve had Thai food before”. A lot of people thought it was Thai food. I think for American borns, I think our concept is easier to understand. I know Stacy would like to be well-accepted in traditional Taiwanese circles as well. If you’re coming from a different country, you have a very strong concept of what you expect that food to be. I think we bridge a good line between the two. View from the second floor of Taiwan Bento. Is there one dish that is very traditionally Taiwanese on your menu? We have a dish that we only serve on Sundays which is the “Chitterlings and Oyster Thin Noodles”. This a pretty traditional dish that you can get in the night stalls in Taiwan. It features large intestines which is not something that is that common in the United States; that dish is very traditional. If there are more fans of this traditional Taiwanese food, will you start offering more traditional dishes in the future? I get a lot of people asking about whether we have or will have Stinky Tofu. I love Stinky Tofu and I have a hard time finding good Stinky Tofu in the United States. Our menu is small because we want to make sure we can keep the quality up on all of our items and we just don’t have the kitchen capacity. Tofu Bento at Taiwan Bento. In the near term, we don’t have plans on bringing stinky tofu or oyster pancakes (we get that question a lot too). To make each of these really well, it is an entire dedicated process for each of them. None of these are trivial. Which is why in Taiwan, when you go to a place that is good for Stinky Tofu, almost certainly they only sell Stinky Tofu. Only in America will you get a hodgepodge of all the Japanese food in one place, such as sushi, udon, ramen, etc. Most places in Japan are not like that. If you go to a sushi place, it’s only going to have sushi. In Korea, if you go to a sundobu house, you only get sundobu. Taiwan Bento Employee Joyce in front of their Blackboard Menu. Can you share with us the tangible item that you’ve brought that represents Taiwan Bento’s journey so far? It’s Stacy, my wife, who is downstairs. It’s her recipes. For me, I am working full-time here. But my passion is business; I like running a business and streamlining it and making it as operationally efficient as possible. The reason why I’m in the restaurant business is because this is Stacy’s passion and it has since become my passion. That’s the only thing it could’ve been. How has Taiwan Bento affected your relationship dynamic? Working with your partner is going to be difficult and the restaurant business is known to be difficult. We’ve had our fair share of difficulties. In the beginning (of Taiwan Bento), I was working a full-time job and that was very tiring. We have different philosophies and cultural backgrounds; we are on the same page but have slightly different goals. Pork Belly Sandwich at Taiwan Bento. Our employee management styles are different. Even though it’s just the two of us as owners; we are very different and cover a lot of diverse opinions. That has caused some friction but it has also definitely gotten better over time. We are very thankful to our staff; we have a lot of great employees here. We now have people that we can trust the restaurant with. There’s also good aspects. We probably don’t do it enough but every now and then, we take a step back and try to take in what we have accomplished. It’s been pretty phenomenal. What is the hardest thing to make or prepare on your menu? Our Sunday offering, the “Chitterlings (large intestines) & Oysters Thin Noodles” dish. That is quite an involved process. We only have it once a week. We pick it up from our supplier in Chinatown and I don’t want to gross anyone out but it’s a large intestine. (laughter) You have to clean and wash it thoroughly; it’s a long process. It also has to be slowly braised for many hours. Intestines have a rough texture and in order to make it soft and pleasant to eat, you have to braise it. Chitterlings & Oysters Thin Noodles at Taiwan Bento. I see that you offer some drink options including the Soy Bean Drink and the Boba Milk Tea. Can you tell me more about these? We do make our Soy Bean Drink fresh from soybeans with a soy milk machine that I actually brought back from Taiwan. We were looking for a breakfast-y type of option. Both of us love soy milk. Especially with breakfast, it is a very common drink that usually goes with breakfast items like 油條 (yóutiáo), the twisted cruller. It wasn’t super popular in the beginning because not that many people knew what soy milk is. But overtime people from different races are now enjoying it. It’s just soybeans and water, and some sugar to sweeten it. We have some regulars that recognize the quality of the soymilk, which is hard to get in this area. Soy Bean Drink at Taiwan Bento. We are very happy that we can offer bubble tea. But we also know that our bubble tea isn’t going to be able to compete against stores that only dedicate themselves to bubble tea. We know we don’t use any powders in our bubble tea; we use real black tea and real whole milk. We only have one flavor so we can focus on the quality. We don’t want to be using syrups or powders; most other places offer this but not ours. If you could tell me three emotions that you want your customers to feel when they’re eating your food? Enjoyment, comfort and those that are applicable to, nostalgia. Calligraphy Event at Taiwan Bento. In terms of the most popular dish on your menu, do you know why that is? Our two most popular items are the “Chicken Bento” and the “Braised Pork”. That was our expectations when we opened. People often ask us “how do you make your chicken so tender”? Much of the chicken in the US is very dry and our roasted chicken is very tender and flavorful. That’s how we want to make it. It’s an attention to detail to make sure you don’t overcook it. Chicken quality is also a factor. We use the same chicken that is used in many Japanese teriyaki establishments; it’s a higher quality. We have many choices of chicken and we’ve tried different suppliers as well. We use one of the most expensive types of chicken, if not the most expensive type. Down to the skin to meat ratio, down to the denseness of the meat, these things can all vary depending on the manufacturer. Finding the right supplier of quality chicken meat is very integral to the process. Taiwan Bento Employees Juli (Left) & Joyce (Right) in the kitchen. Our Braised Pork dish has been one of our bestsellers since the beginning; it’s just been getting better over time. When I say comfort, that’s the dish I’m thinking about. It’s hearty without being too overwhelming. The Popcorn Chicken, the Pork Belly Sandwich and our Fried Oysters, for those who love seafood, are also very popular. Braised Pork at Taiwan Bento. How did you start partnering with We The Minis on offering cupcakes and how has their products enhance the Taiwan Bento experience? Wenter, the owner of We The Minis, was actually one of our customers from very early on. He gave us some suggestions to the aesthetics of our space, such as the Blackboard Menu. After a while, we got to know each other and he told us about his cupcakery. It’s a great concept; we love his product, all natural and he donates a portion to charity. What’s not to like? He doesn’t have a storefront right now and we don’t have desserts here so it made sense. Again, desserts would be a whole another venture into making them well, like a dedicated dessert place. So I figured this was a way for us to have a high quality dessert offering. We don’t have the capability of making these (cupcakes) in-house. Churro Cupcakes by We The Minis at Taiwan Bento. Peanut Butter Cup Cupcakes by We The Minis at Taiwan Bento. How has modern technology such as food delivery apps affected the food business in general and will Taiwan Bento join in on this effort? We are on the food delivery services such as Caviar and Post Mates and are currently looking at a few others. That has been really great for us because it is a great example of a win-win under the Web 2.0 community. They take a cut but we also don’t need to upkeep our own delivery drivers or vehicle insurance. It allows our customers who want delivery to be able to get delivery. That has been quite good for us; we’ve been on Caviar since August of last year. Starbucks has an app where you can order straight from your app and pick it up straight from the counter which is pretty awesome. It’s lightning speed! You don’t need to wait in line anymore; both my wife and I like to use that. I don’t think this is going to be a widespread thing for another decade or so; it’s a good to have. Just like automatic cashiers, there was a time where they tried to just have automatic cashiers where you can scan your own stuff or banks with robot tellers; that time will probably come but at this time there’s enough people that still want that person to person interaction. There are benefits to ordering in person, such as when things sell out. More restaurants will sell out of some items and there will always be a lag between when I notify the third party app as opposed to when someone comes into the store or calls; I could tell them right away. I see that you have this giant paper crane in the restaurant; what does it symbolize for you and how did you manage to fold that? When we were opening the store, we had a lot of things to focus on. We wanted some sort of decoration and a friend of ours suggested paper cranes. Our friend Austin helped with some of the design aspects of the space. The initial concept involved a lot of small paper cranes. I really like large art installations and outdoor sculptures; like the Storm King Art Center in upstate New York. I like big art. I thought, “Why don’t we just make a paper crane?” (laughter) We were on a time crunch so we couldn’t special order paper. We went to the local office store and learned that the largest commercially available paper is only two feet long by two feet wide. We initially made a smaller paper crane so we can figure out the dimensions and the scaling from the starting size to the final size. We started with an 8 feet by 8 feet size square piece of paper and made it thicker by making it double-sided. We commenced folding this giant paper crane directly on this floor before we had all this furniture. There are some things we couldn’t comprehend; the weight of the paper after it’s been folded was very high and the wings of the crane has flopped out, even after we included wiring in it! We do try to make the wings look like it is standing. It symbolizes good things like prosperity. Where he is now, he’s like a guardian over the restaurant. Is there any advice you would suggest for anyone who is interested in entering the food business? If you’re afraid of taking risks, you should not be in the food business, especially for any business. Too many people are too averse to risk in their lives. You have to love it; you only go into the food business if you love it. There’s easier ways to make money. Churro Cupcake by We The Minis at Taiwan Bento. There are also some perks to be doing food versus drinks. You have a very diversified customer base so you probably won’t go away fast if you’re doing well. There are so many boba (bubble tea) shops in Chinatown right now; it’s a very competitive place. It’s easier to start a drink establishment like a boba shop but it’s also very easy to fail because if there is someone who opens a competitive shop and absolutely has better quality or price, you’re screwed. On the other hand, food is not as replaceable. Even if another Asian food place opened, it probably won’t be exactly the same. If you could create your own slogan in life, what would it be? “Life is too short to not love what you're doing”. That’s it. Everything else will fall into place. Stacy Tang (Left), Willy Wang (Center) & Sandy Elle (Right) at Taiwan Bento. Taiwan Bento will be attending the Taiwanese American Cultural Festival in Union Square this year; it will be taking place on Saturday, May 14th. Owner, Founder & Cake Enthusiast, Wenter Shyu (Left) & Sandy Elle (Right) at Taiwan Bento.